Looking for an allergy-friendly brunch recipe? 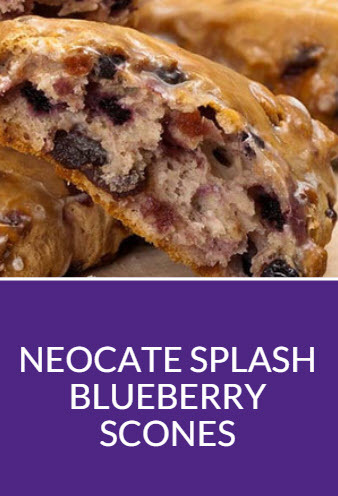 Our Neocate® Splash Blueberry Scones are perfect as a dairy-free dessert, lunch, or even a snack idea. This recipe, developed by a professional chef who also happens to be a Registered Dietitian, is one of our favorites! If you are feeling adventurous: experiment with this recipe by substituting another flavor of Neocate Splash. To meet a variety of taste preferences, Neocate Splash comes in four flavors: Orange-Pineapple, Grape, Tropical Fruit, and Unflavored. You could also substitute prepared Neocate Junior! Another fun addition is to sprinkle the scones with sparkling sugar, cinnamon sugar or a sugar glaze, if desired. For drier scones, use less of the Splash mixture. Looking to add a little pizzazz to your scones? Sprinkle them with sparkling sugar or cinnamon sugar, if desired. Whisk together the flour substitute, sugar, baking powder, salt, and xanthan gum and nutmeg, if using. Work in the cold margarine till the mixture is crumbly with a pastry cutter or fork. Whisk together the Splash Tropical Fruit, egg substitute, and vanilla till frothy. Drop dough by rounded tablespoons onto the baking sheet. Let the scones rest for 15 minutes. Remove from the oven and let rest for 5 minutes or so before serving.